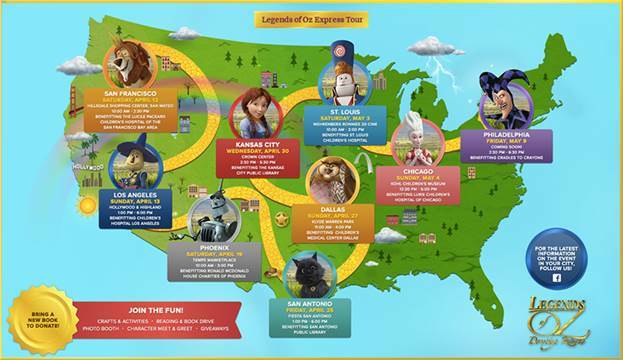 The animated film release LEGENDS OF OZ: DOROTHY’S RETURN has launched the ‘Legends of Oz Express Tour’ which will bring the magical world of Oz to kids across the U.S., and to kids here in the Kansas City metro. The event will bring a family-friendly tour and book drive to Crown Center on Wednesday, April 30th from 2:30 p.m. to 5:30 p.m.
Join Dorothy, Toto, and their new friend, Wiser the Owl, from the upcoming 3D animated feature, LEGENDS OF OZ: DOROTHY’S RETURN, as they bring the magical world of Oz to kids across the U.S. on the “Legends of Oz Express”! The Oz-someness starts at (2:30 PM on April 30) at Crown Center in Kansas City as part of a nine city tour before heading back over the rainbow on May 9, 2014, the opening day of LEGENDS OF OZ: DOROTHY’S RETURN in theaters. Families will follow their hearts at the Tin Man’s Friendship Club by making friendship pins, test their brains in the Scarecrow’s Workshop with arts and crafts, and show their courage by performing on the Lion’s “Mane” stage. They will also hang out in cozy “Candy County” and hear the story that inspired the film, Dorothy of Oz, written by celebrated children’s author Roger Stanton Baum. Kids will virtually follow the yellow brick road in the “Legends of Oz World” iPad gaming stations, and Dorothy and her friends will be there for pictures, prizes and fun! Bring a book to donate too!